The latest news and rumours from the Farm Model World including new items from Ertl and a new Big Bud in 1/32 scale. David Laley reviews 1/32 IH tractors released for the Lafayette show. Nick Wigdahl takes us through the various front loader equipment available to the model farmer. 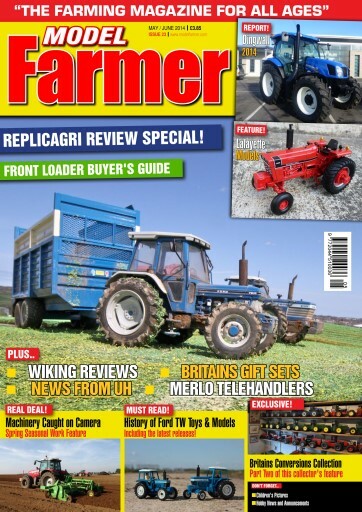 We look at recent new tractors from Universal Hobbies. Nick Wigdahl reviews the new forage wagon from WIKING. Just in time for silage 2014. Nick Wigdahl reviews the new compact tractor from this cult German OEM. A review of Wikings new Pottinger Novacat mower. We take a look at this huge new trailer from the French model maker. 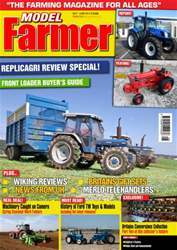 Replicagri's latest tractors are put to the test. David Pullen reviews two new telehandler models from ROS. An in depth analysis of the new Fendt 939 from WIKING. We review one of the best implements ever produced in 1/32 scale. We complete our look at Rick Smith's Custom Model Collection. The history of these popular tractors is documented. Bill Cruickshank takes us through more Britains gift sets from the 1980's. Bill Cruickshank reports back from the second annual Dingwall model show. Nick Wigdahl provides a Spring analysis of what is happening on the fields around t he UK.